Slot machine Twin Spin can be played in Oranje Casino via the online casino and via the mobile casino in a Touch version. The game offers five reels with three rows, but has no paylines. Instead of winning lines in this game, no fewer than 243 different options are offered to create a winning combination on the reels. In that context there is also talk of 243 win ways. Several features have been assigned to the game and the theoretical payout percentage is 96.6 percent. There are several settings that can be adjusted by the player. Twin Spin offers players many opportunities to win money with no less than 243 win ways. A win way is formed by a combination of three equal symbols that are linked from the left reel. The symbols added to the game range from diamonds to sevens and from bar symbols to cherries, letters and numbers. If you look at the payout table, then the numbers combined are the least worth and the diamond symbols in a winning combination of an equal number most on. Of course there are special features available in the game that increase the chance of even more winnings. 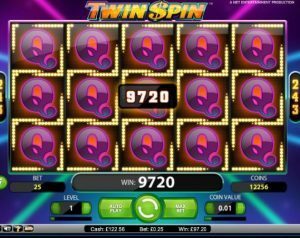 Twin reel is a feature that is unique and occurs in the game of the Twin Spin slot machine. Because there is a twin reel feature, at least two identical reels with symbols will be seen after every spin. However, it is even better if it is also possible that three or four reels are completely the same or even that all reels on the screen are the same. Furthermore, the two same reels can appear at any position and form, for example, the first two reels or, for example, reel three and reel four. The wild symbol is very easily recognizable, because the picture says “wild”. If there is a wild symbol at any position on reels two, three, four or five, this symbol can replace all other symbols in the game. This ensures that the moment a wild game is involved, the chance of a winning combination falling is increased. The lowest coin value to play on the Twin Spin slot machine is 0.01 euros and the lowest bet level. bet level is one. A total of ten bet levels are available and the maximum coin value is 0.50 euros. A higher coin value and higher bet level leads to higher winnings compared to playing with the lowest coin value at bet level one. After each game turn, you can always use the option to change these game settings. A number of settings are still available, such as quick spin to make the reels spin even faster during a turn.